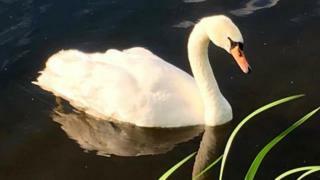 A swan has died after being attacked by a dog in Aberdeenshire. The badly-injured bird was recovered from an island in the River Ythan in Ellon on Sunday. Staff from the New Arc animal rescue centre took the swan for veterinary help. However, staff member Keith Marley said the mauled swan died despite medical attention. He urged dog walkers to keep their pets on a lead when near wildlife. Anyone with information about the incident has been asked to contact Police Scotland.